These meatballs make the perfect appetizer or a fulfilling meal, served over steamed rice or “cauliflower” rice. 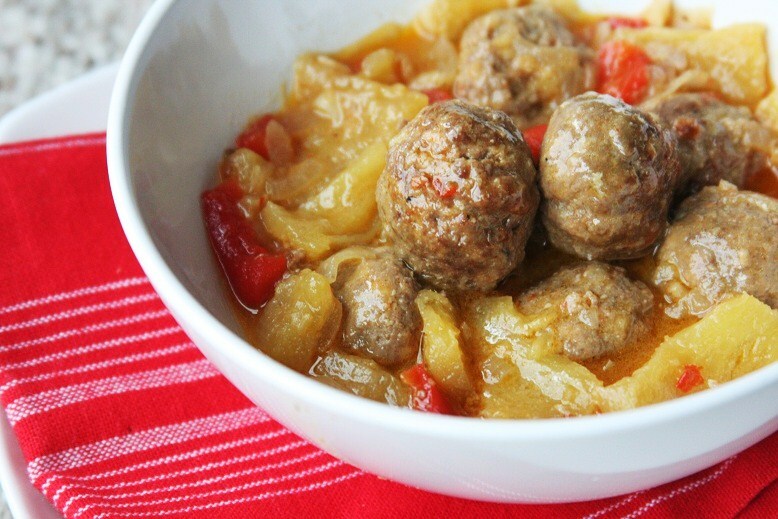 My version of sweet and sour meatballs uses fresh pineapple… I try to stay away from anything in a can these days. I also added red chili flakes for a special kick, however you can easily adjust the amount to reach the level of heat desired. This dish is also wonderful served as an appetizer at a party. Just prepare it through step 4, then place all ingredients in the crockpot and let simmer on low all day! Or make it a few days before and reheat in your crockpot. These sound wonderful and easy! Thank you so much for sharing. I can’t wait to try them! These sound so good. I haven’t made meatballs since going gluten-free and I miss them! These are SO addicting so make a lot. Wonder if they freeze well? Perfect amount of sweet and tangy. I was a very happy taste-tester for these. Ok, now of to make kale chips (also addicting!). Made these today Michelle, mmmmmm,mmmmm, mmmmm did I say mmmmm? They were delicious! Would it be OK to sub ground turkey? Do you think any adjustments would need to be made to anything so the texture is not dry as turkey can be? something else that works great for binding meatballs together is flax seed; less expensive than ground almond, so it’s a nice option.